I am asked all the time about decorating houses and to give ideas. This segment is all about tips and tricks that will help. Decorating is all about placement. Look on the internet for images, I search all the time to find the area I want to recreate. For this house I searched winter scenes. Once you find your image buy everything you need to recreate the image, everything except wallpaper and flooring for your in-game house. The bazaar is one of the best places to find all your housing needs. I have learned from decorating a splash of color helps in every design. Let’s take this ice school house, it’s full of blues, grays and white. Without adding that splash of color your items would just fade into the background. Snowy maple trees make the perfect splash for me in this house. I try to make houses look as natural as possible. Everyone has their own unique style of decorating. Be yourself, show your style. 1. Gold, I always start off with 100k or more. Never fails I find something I want and did not have the gold for it. 2. Pick the right house for your need or theme. 3. Item count - know how many you can use for both inside and outside. The item count goes really quick when decorating. 4. Craft any items you want to use in the house. 5. Any crowns item you want. Get those first by purchasing or farming for them. Bring your house to life by adding pets, mounts and plants. One thing to keep in mind though is if you are creating a theme, as in this winter house I created, you will need to have items that represent that theme. Who would want a fire bush in a winter theme? You could even ask your family or friends to help you create a special area for ice skating or a dinner party, just have them dress up. Decide what room you want to be for what, kitchen, bedroom, hallways, or just a place to view special items. For museums or show places make sure to count for platforms in item counts. Especially if you are making mazes all those pieces for each turn take up that item count really quickly. Details are the items that show what the room is made of. Let's say you are creating a kitchen, okay well you need kitchen details: shelving, food, pans and tables. Even the little details count. The more you give your guest to check out the more they like it. All big rooms have a focal point. Like this ice school house the main visual point is the ice coming up through the floor. I found it so easy to decorate from that focal point out. 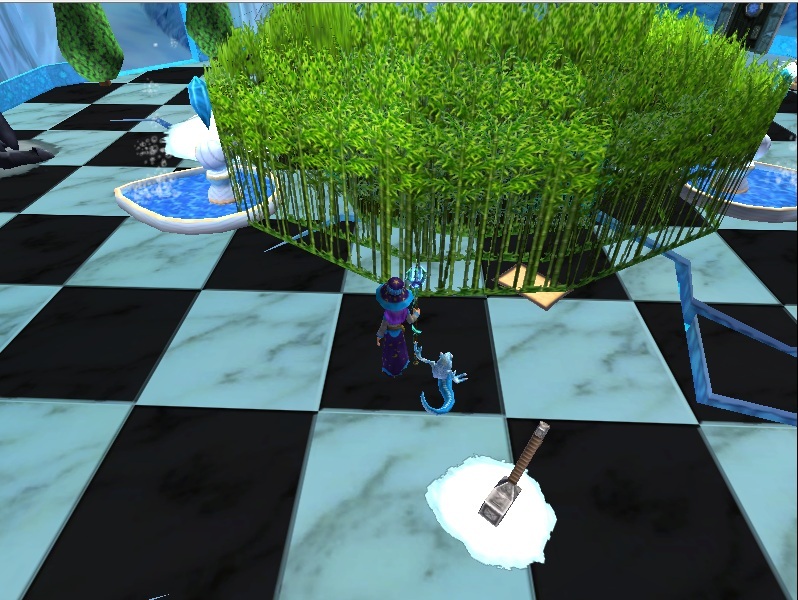 I wanted that splash of color which was the green bamboo I in circled the ice with. Even if you are not creating a themed area like this house you should start with a focal point and work out from there. Focal points can even be a piece of furniture you really like. One thing to remember you do not have to completely fill the room for it to look great. Sometimes less is more. Basic floating ,mat covered with snow pile. Now time to buy flooring and wallpaper. I know how hard it is to find that perfect floor or tile, let alone get them to look great together! This is usually because not all spaces are the same. The red brick floor I have in the mid-level rooms did not look so great in the main area of this winter themed house. Try lots of different styles. One tip I can give: keep one of each type of flooring and wallpaper in an attic. I do this so I can test each type in the room I am creating. I always place my floor and wallpaper last. It never fails if I place it first it won’t go with the decor I decided on for that room. I hope this segment of tips and tricks answers some of your questions. Until next time, Happy House Decorating! Special thank you to Cass for the amazing video. who wants a fire bush in a winter themed house? Hmm... I DO! Thats ironic that you would say that in this post because i am currently making a "castle of fire and ice"
Haha! I have a fire and Ice house too. This one is purely Winter themed though, Hence reason for fire bush statement.